Employing a Rollator or a Walker can be a major transformation in the quality of your life. Such equipment keeps your life in motion by providing additional support to maintain balance and firmness while walking. 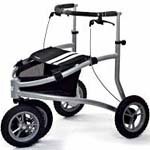 To provide you ease and comfort, Sportaid offers the best and broadest collection of Walker Accessories, 3 and 4 wheel Rollators and Walkers online. Our innovative and high quality products from international brands include Invacare Mobility Walkers and 3-Wheel Mobility Rollators. To ensure smooth and effective movement, browse through our impressive selection of Mobility Rollators & Walkers below or feel free to call 1-800-743-7203 for help purchasing your rollator or walker today. You'll be glad you did! If you get your Mobility Rollators & Walkers from Sportaid now, you could save up to 55% over the competition! Find the Right Mobility Rollators & Walkers for you! 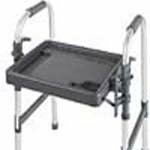 Walker Accessories: - Walkers are designed to enhance maneuverability, and they can make an even more profound impact on your mobility with the availability of varying accessories. 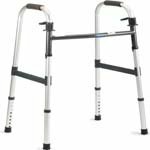 If you are already using a walker or planning to buy a new one, check out the abundance of walker accessories to ease your everyday activities. Sportaid offers everything from the Invacare Walker Basket to Guardian Glide Caps or Guardian Walker Wheels for Bariatric Walkers. Invacare Walkers: - Sportaid brings you a complete range of Invacare Walkers, the leading manufacturer of medical care products and equipment. Invacare Walkers with easy adjustments provide the stability and comfort you need at economical prices. You can choose from an Invacare Adult Dual Blue-Release Walker w/5" Fixed Wheels, a Heavy Duty Dual-Release Adult Paddle Walker, or a WalkLite Walker to maintain your independent movement. Our expert team will assist you in choosing the right walker from our huge collection according to your specifications. Sportaid offers an exceptional collection of Guardian Walkers which includes the Easy Care Folding Walker Adult, Envoy 460 Economy Rolling Walker, and the Bariatric Walker. Our experienced team will guide you on choosing the best option. Walk freely and stay active with Sportaid’s flashy and bright stock of 4-Wheel Rollators. We try to enhance the level of comfort by offering our innovative products from preeminent brands. Whether you opt for a Invacare's 4 Wheeled Rollator, or a Rollite Rollator, we assure you of world-class ease of use and smooth operation. Trionic Walkers: - Trionic Walkers are the preferred choice of highly active and energized people. 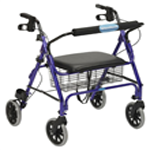 The unique design and style of these walkers allow easy transport and let you enjoy a new walking experience. Sportaid’s unparalleled cluster of Trionic Walkers includes the Nordic Walker, Mountain Walker, City Walker, and the Golf Walker. Select the best one based on your preferences with the help and guidance of our expert team. Whether you are a new customer or someone who has been with us for a while, we guarantee satisfaction. After over 25 years in the business helping people find the appropriate Mobility Rollators & Walkers at the lowest prices, we continue to lead the industry! We are capable of beating any competitor's advertised price, just call! Our customer service staff has over 50 years of experience, plus over 90 years of combined wheelchair use experience. We look forward to working with you! I use the heavy duty tube for my wheels and tires around the house. We live in a rural area and sidewalks are not very common out here. I like the set up I use the tire , tube and wheel for off the sidewalk use and to work around the house.